Year: 2013. 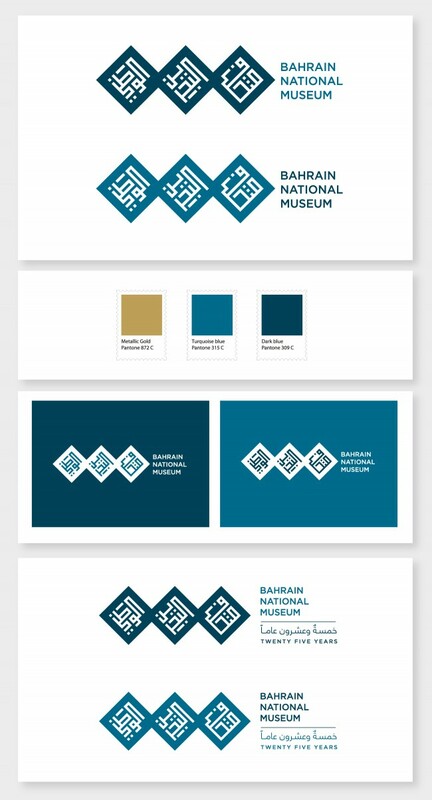 Client: Ministry of culture, Kingdom of Bahrain. The Bahrain National Museum, the very first museum that opened in the Arabian Gulf region, celebrated its 25th anniversary in 2013. For this occasion, the museum commissioned Tarek Atrissi Design to kick off a branding for the museum and design its graphic visual identity. The iconic architecture of the museum was our main inspirational for the project. The building, designed by the Danish architecture firm KHR arkitekter in 1987, consists of three cubical structures attached to each other. The squarish floorplan of the building was the basis of the graphic element we adopted for the logo. The three Arabic words of the museum name were designed in a square kufi Arabic calligraphy style to fill in the squarish forms in the logo. The result is a very recognizable typographic logo for the museum that draws a visual similarity to the museum’s iconic architecture- and a logo that is the basis of an identity system further developed for the museum. The logo was revealed in the special 25 years celebration of the museum in December 2013. In addition to the branding- Tarek Atrissi Design have designed a special bilingual publication that showcased an overview of all the exhibitions that took place in the museum since its start in 1988 until today.